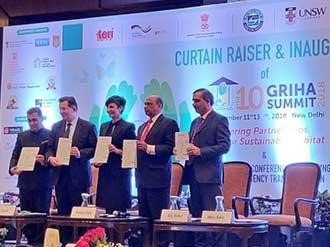 Green Rating for Integrated Habitat Assessment (GRIHA) Council kicked-off the 10th GRIHA Summit by launching GRIHA for CITIES rating, in the presence of Harinder Sidhu, Australian High Commissioner to India, Prof Ian Jacobs, President and Vice Chancellor, University of New South Wales (UNSW), Sydney, Australia, and many other dignitaries. Green Rating for Integrated Habitat Assessment (GRIHA) Council kicked-off the 10th GRIHA Summit by launching GRIHA for CITIES rating, in the presence of Harinder Sidhu, Australian High Commissioner to India, Prof Ian Jacobs, President and Vice Chancellor, University of New South Wales (UNSW), Sydney, Australia, and many other dignitaries. The GRIHA for CITIES rating has been structured as a framework for sustainable development of a city, to be achieved by measuring ‘greenness’ of existing as well as proposed cities. The rating sets performance benchmarks for key resources such as energy, water, and waste, and evaluates performance in areas such as smart governance, social wellbeing, and transportation.